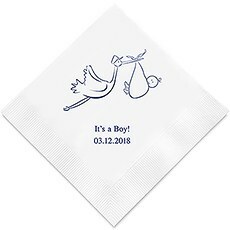 Are you celebrating a new baby on the way? Or are you planning for your baby's christening? 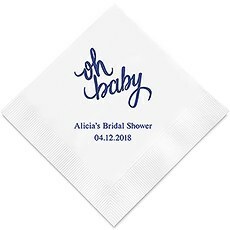 At The Knot Shop, we offer classy personalized baby shower napkins that can also be used for christenings. 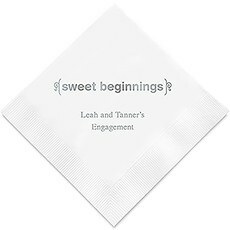 There are styles that are classic and whimsical to fit your preferences, and our custom baby napkins are available in various colors with different imprint foil colors for a vibrant display. 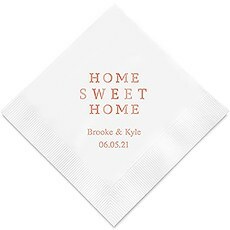 These budget-friendly baby shower cocktail napkins, luncheon napkins and dinner napkins are an easy way to create a more personalized baby shower that matches your personal tastes.Choose a baby shower design and colors to match other decor of your special occasion, such as tablecloth, centerpieces and room decorations. 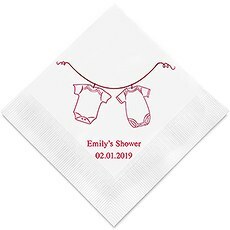 From a classic Celebrate to whimsical stork and baby or twin onesies hanging on the line, these designs celebrate your new family addition. Hello Beautiful and The Adventure Begins are other designs that are appropriate for expectant mothers. 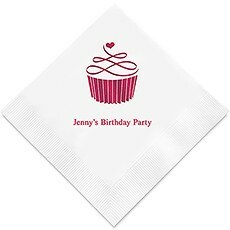 Two lines of text can be customized for a name and date of birth. 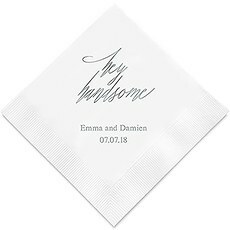 In the case of christening table settings, this second line can be the christening date.Our luxurious and very sophisticated foil-printed customized napkins go a long way to dressing up a table setting for a warm, memorable experience. 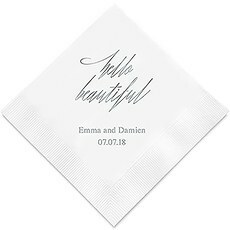 These personalized napkins are sold in quantities of 100 or 80 (for dinner napkins), and they provide a lot of bang for the buck in terms of decorative value.Personalized napkins for special events are not just practical. 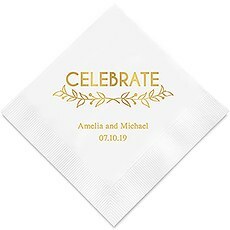 They make wonderful inexpensive mementos that can be pressed into a scrapbook along with photographs of the happy occasion. 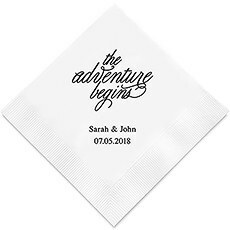 The Knot Shop turns your visions of the perfect engagement party, bachelorette party, bridal shower, wedding, baby shower or anniversary party into reality.